First, I’ll arm myself with the handy reference screenshot. The sketch is, shamefully, done on lined paper using a regular pencil or ball pen, using construction lines to build the skeleton, flesh and clothing.. I will be using a separate layer for the body colour. I know already where my light is coming from, so I can start by “carving” the shadows on her body which will give her depth. Next, I’ll be creating the light source on a new layer. This character uses (duh) Kinetics powers so I’ll want to use a light and swirly FX. All the power will concentrate in her left hand therefor this will be the light source. Now I’ll dress her with her bikini and colour in her hair. I won’t to happy with the skin tone. Too flat. Lifeless. 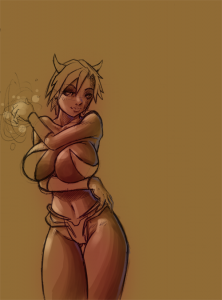 So I’ll make a simple line of pink on a new layer, right on top of the brown background/skin layer. Changing the pink’s layer attribute to Linear Burn for it to blend in on the brown. You can see a much more fleshy colour and look now. City of Heroes/Villains characters can obtain auras to embellish themselves and make them stand out even more. You can see that in the first screenshot, Sis Kin’s aura is a simple pink, body glow. Let’s do this now. Once again, a pink outline, a layer property change and outer glow should do the trick. I’m quite happy with this simple piece. There are no added backgrounds or details. I just want to keep the focus on the character.